LANSING, Mich. — The General Motors bankruptcy, announced Monday, was expected, having been predicted for weeks if not months. But the enormity of how far this once mighty giant of U.S. monopoly capitalism has fallen is shocking nevertheless. For many it seems like not so long ago when GM was not only the leader of all auto producers with a commanding 54 percent of the U.S. market, it was also the undisputed dominant corporation in the country’s economy. In filing for bankruptcy yesterday, GM said it will close 14 plants in the U.S., half of them here in Michigan. It will leave less than 40,000 GM autoworkers nationwide, a tiny fraction of the 395,000 employed by the company in its heyday in the 1970s. Nowhere is the shock greater than Michigan, GM’s birthplace. Today, the state has an official unemployment rate of almost 13 percent, and because it has seven times the auto jobs of the next highest state, Ohio, people here fear things will only get worse as the job loss in auto ripples through the economy. Under a plan announced by President Obama on Monday, the federal government will provide up to another $30 billion to keep GM afloat while it emerges, restructured, out of bankruptcy. That is on top of $19 billion in federal money the company received earlier. The Canadian government will chip in another $9 billion as part of the deal. The downsized company will have 60 percent U.S. government ownership, with smaller portions of its stock held by the United Auto Workers union, bondholders and the Canadian government. In exchange for the new government aid, GM agreed to go through bankruptcy to eliminate more than $27 billion in debt held by bondholders. It also agreed to build a new small car in idled UAW factories and to increase the share of U.S.-based production from 66 percent to 70 percent, the White House said. The union has agreed to a no-strike pledge until 2015. 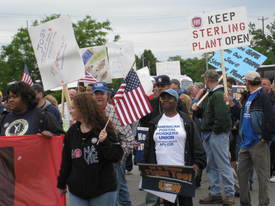 Many at the rally were angry that GM, while receiving bailout money which may total $50 billion or more, is shutting down 14 plants at home while it increases production outside the country. “When you offshore jobs, you export the American Dream,” said Bernero. Bill Parker, president of UAW Local 1700 at Chrysler’s Sterling Heights, Mich., Assembly plant, which is also scheduled to close, said workers are outraged that Chrysler wants to close an additional five plants. His plant employs about 1,400 workers and produces the Sebring sedan and convertible, along with the Dodge Avenger. He asked the crowd of several thousand to join him in calling on the Obama administration to demand that Chrysler reverse its decision. The Rev. Jesse Jackson emphasized the effect the bankruptcy and closing of GM plants will have on communities. When you close 14 plants and hundreds of dealers, you also close auto suppliers; you cut off a town’s tax base, you close their schools, and cause their teachers, police and fire departments to also shut down, he said. As details of the GM bankruptcy plan emerged, some 3,000 labor and progressive activists were meeting at the America’s Future Now conference in Washington. Another labor leader, speaking informally, noted that the auto union was caught “between a rock and a hard place” and was able to come out of the bankruptcy negotiations with a few things including a little less pain for some active workers and retirees. But, he said, “Once again, we have workers making the sacrifices while companies close plants and ship operations overseas. Once again we are doing what the finance industry says we should be doing to make a company ‘viable’ even if that means more massive job loss and continued de-industrialization.” This is a continuation of an approach that “just doesn’t cut it,” he said. “The problem with doing business this way is that it leads to disaster for workers and in the end it doesn’t do much for GM either — by doing it their way they ended up deep in debt,” the labor leader said. jrummel @ pww.org. Joel Wendland and John Wojcik contributed to this story.